The Great Corporate Tax Shift in three parts. 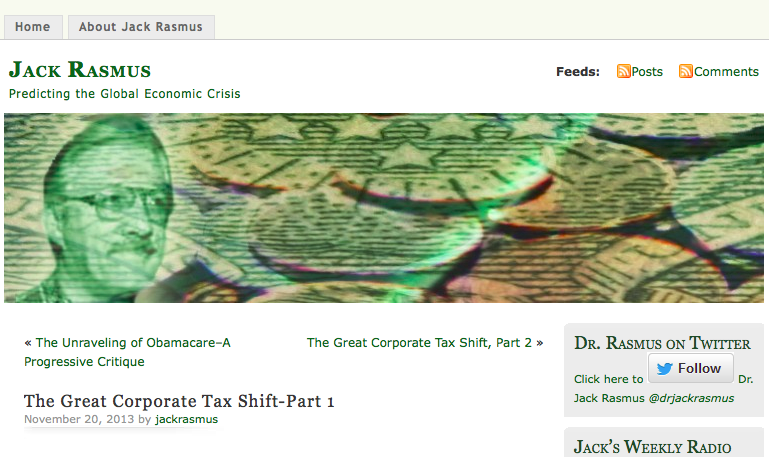 Jack Rasmus should be read by anyone interested in what is happening within Capitalism currently. If you want to read something that is interesting and insightful on what is happening to our debates on capitalism and the economy, then this three part series is a good place to start. There is money out there, but it is not going where it used to, as the corporate elite have been very successful at capturing the debates and agendas of our political elites and this is having huge impacts on how we perceive this stage of the global economy. Why I am writing about this on my photography blog? I Have for sometime told anyone in my classes that the subject they should photograph is the one that they know. The subject that they know will be the one that they read about and explore with interest. I say this because, I have become ever more interested in what capitalism is and how it affects us as global citizens. This is the area of interest that I am now concentrating on for my photography interest. I spent a long time thinking about this and realised that I need to photograph what interests me and this is what I need to and have to explore in more depth. So my subject moving forward is how capitalism works as a documentary photographer. Each of us will have different areas of interest and I want to get out of the photography ghetto and this is how I will do so by exploring this topic photographically.